There is a variety of different accommodation in Chester which can be found through internet searches, on www.visitchester.com or by calling 0845 647 7868. There will be food and drink available, including a bar. Anything from tea and coffee to a 3 course lunch at the restaurant overlooking the finish. To enter the marathon or metric marathon, you must be 18 or over on race day. Drinks stations will be at every 2.5 to 3 miles, with bottled water at all 9 stations stations. Isotonic sports drink will also be available at drinks stations 2, 4, 6 and 8 and we hope to have gels around the course too. Futher detials will be announced when confirmed. There will be a baggage store at the racecourse. One bag per runner. Open for bag drop off 07:30 - 09:00 for marathon and 07:30 to 10:15 for the metric marathon. Open for bag reclaim 11:15 - 16:00. The race cut-off time will be 6 hours for the Marathon and 4 hours for the Metric Marathon. The road closures will be lifted from each section in turn based on a 6 hour marathon finish time. If you are a slower runner please be aware that our teams will be working around you to clear up the course. Marshals on the road will be stood down and normal rules of the road will apply. You will be expected to become a "prudent pedestrian" once road closures are lifted. Parking for competitors and supporters will be available on the grass at the centre of the Chester Racecourse. The car park will open at 0630hrs and will close at 0800hrs to allow for the start of the races. We will have chip timing with intermediate splits at 10k, 20k, halfway, 30k and 40k. I ran my first ever Marathon here and loved it. It was very well organised with fantastic support from the crowds and the volunteers. Very scenic and mostly flat route on closed roads. Starts and f... I ran my first ever Marathon here and loved it. It was very well organised with fantastic support from the crowds and the volunteers. Very scenic and mostly flat route on closed roads. Starts and finishes on the Chester Race Course which is easy to get to as it's in the city centre. Refreshments approx every 3 miles with Water, Lucozade and SportsGels. Plenty of toilets at the start and regularly en-route. Plenty of support from the local residents who provided additional refreshments. There were 'Race Angels' at the 2 miles to go stage who would help any runner who wanted additional motivation for the last stretch. Great goody bag and finishers medal at the end - would run this event again. I was 37 when I completed this distance, it was my first ever Full Marathon and took me 4hours 10 minutes. From the start line the race heads through the town, passing the local Town Hall. The runners also pass Chester Cathedral, the split level Middle Ages "Rows", Eastgate Clock, Amphitheatre and go through the ancient Roman Walls four times before leaving the City and heading across the Old Dee Bridge. 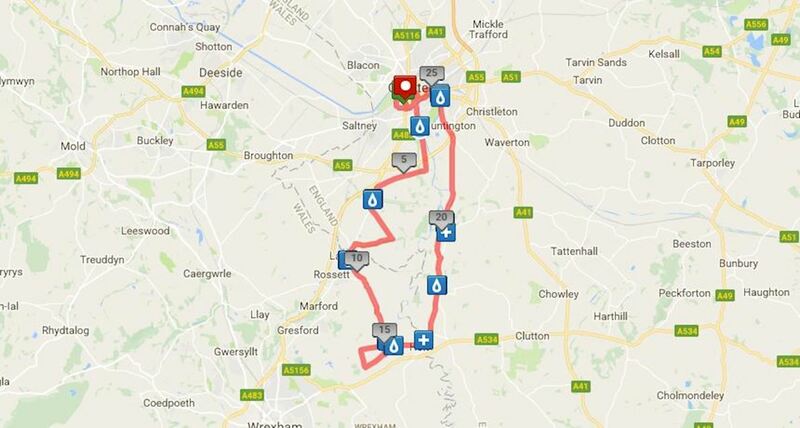 Runners then head out of Chester, via Pulford, crossing the border into the Welsh villages of Lavister and Rossett. The route then follows a small loop reaching the old village of Holt before crossing the ancient Roman bridge at Farndon, leading back to England. On re-entering the City, runners pass the River Dee along the Groves and Castle Drive before a triumphant finish at the racecourse!